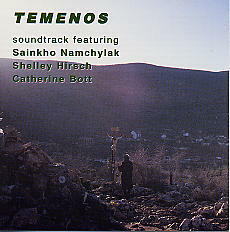 Temenos, a film by Nina Danino, is a metaphysical thriller. The title means sacred site; and refers to the places around Europe where the Virgin is said to have appeared, or said to be still appearing. Don't be misled. This music is not about pretty songs or moodish ambient electronica. Prepare yourself for the most amazing sounds from three most amazing voices, with Sainkho delivering her famous over and undertones, and cries of both ecstasy and terror.